Since the browse page is built logically around parent type numbers rather than the original version of SCO, which was not ordered hierarchically, the images displayed to the right of the descriptive summary include both parent and subtype specimens. As a result, the photographic coverage of parent types is enhanced. 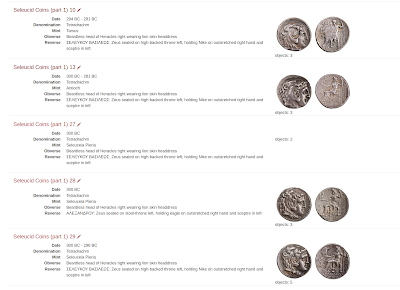 At present about 25% of all Seleucid types have at least one physical specimen (which is almost certainly photographed, since our NEH-funded Hellenistic Royal Coinages project has funding to catalog and photograph our entire Seleucid collection). 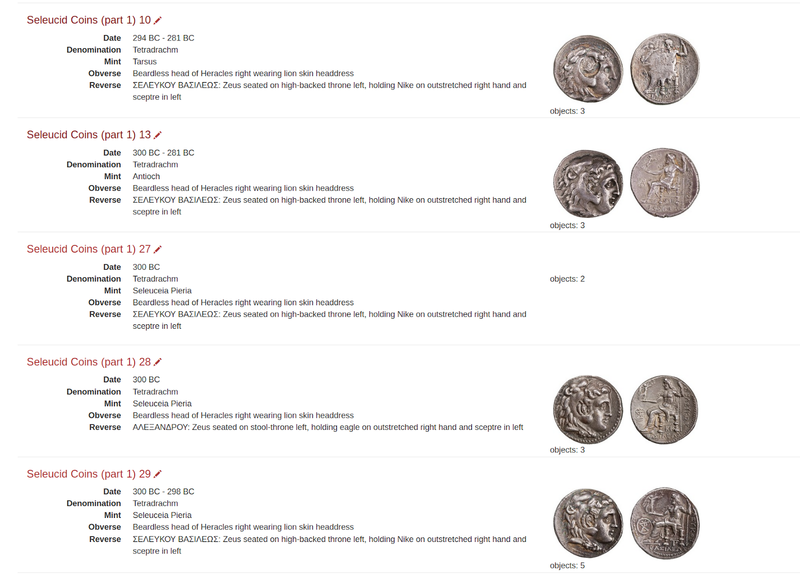 To reiterate: we still have more cataloging work to do for the later Seleucid coinage. The photographic coverage can be derived from a SPARQL query of Nomisma.org. This project, along with PELLA and the impending Ptolemaic Coins Online, should prove to be a valuable resource for Hellenistic numismatics to students, scholars, general hobbyists, and archaeologists and museum professionals in aid of identifying and cataloging specimens from museums or excavations. Geographic distribution of Seleucid coinage from East Greece to Ai Khanoum.